I’ve been meaning to write about my experience with Operation Christmas Child since before it happened but now is the first chance I have to put it all down. First off, if you ever have even just an inkling of doing work with Operation Christmas Child or Samaritan’s Purse, go for it! It was such a blessing to be able to be a part of something so big. If you have no idea what I’m talking about, take a moment to visit their website. I’ve been coordinating OCC at my church for a few years now. There is just this great feeling I get in planning it all out, buying goodies for the boxes, giving suggestions to my church family; knowing that the end result of it all is that kids all around the world will not only be blessed with a box full of gifts, but more importantly, the Good News of Jesus. 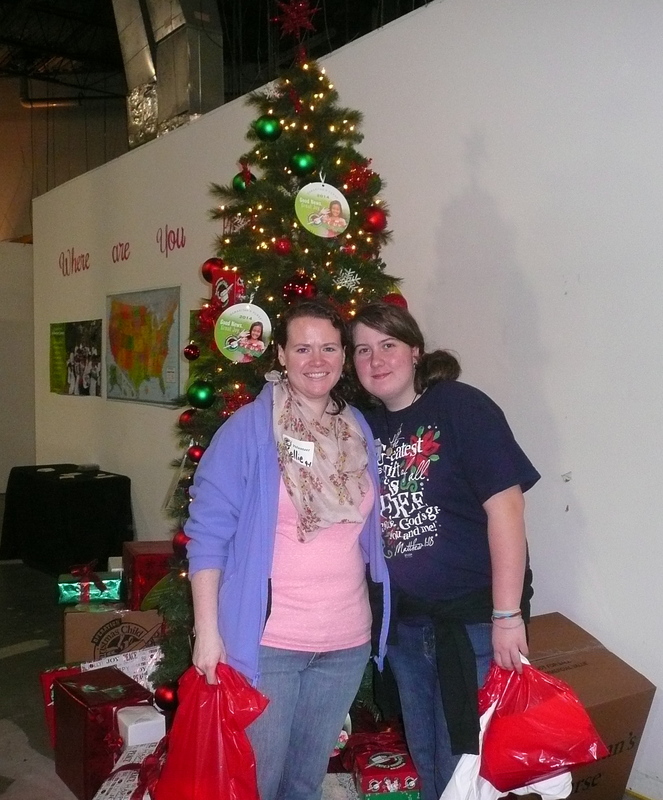 This past year I had a few different encounters with people who have done more with OCC than just pack boxes. One was a women who not only helped out at a processing center, but also went on to actually distribute boxes to kids in Africa. These were such inspiring stories that touched something in me that I never felt before. I knew I had to do more. I found out in October or November that OCC had a new processing center opening in Maryland this year. As I’m in New Jersey, that’s much closer that trying to get to North Carolina. While planning our packing party at church I spoke to a few friends about organizing a group trip for next year and they seemed on board with the whole idea. What a great way to serve as a church family! Our packing party came and went. 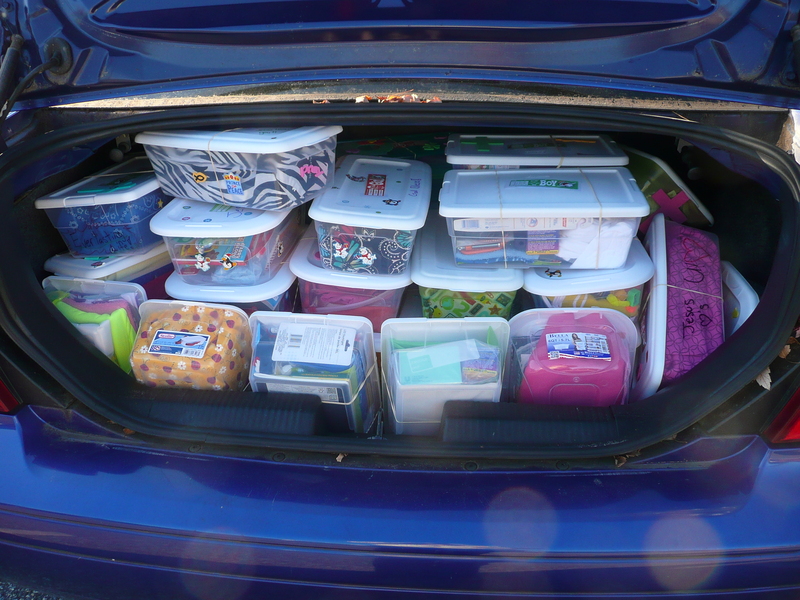 We packed and dropped off 53 shoeboxes during National Collection Week (which filled the trunk of my car and then some). The more I thought about organizing a group trip next year, the more excited I got. The more excited I got, the less I wanted to wait for next year. I talked to friends about the possibility of going this year. And, of course, I did not want to go by myself. I asked if their 13-year-old daughter would want/be allowed to come with me if I was able to get a reservation. They said yes and so with the added bonus of a traveling companion I thought even more about it. I went to make a reservation, but the day I wanted was full. A couple weeks before, the Monday after Thanksgiving, was free for a 4 hour slot. I booked a hotel so we could leave the day before and it was settled. I was so excited I couldn’t stop smiling for a good couple hours or so. 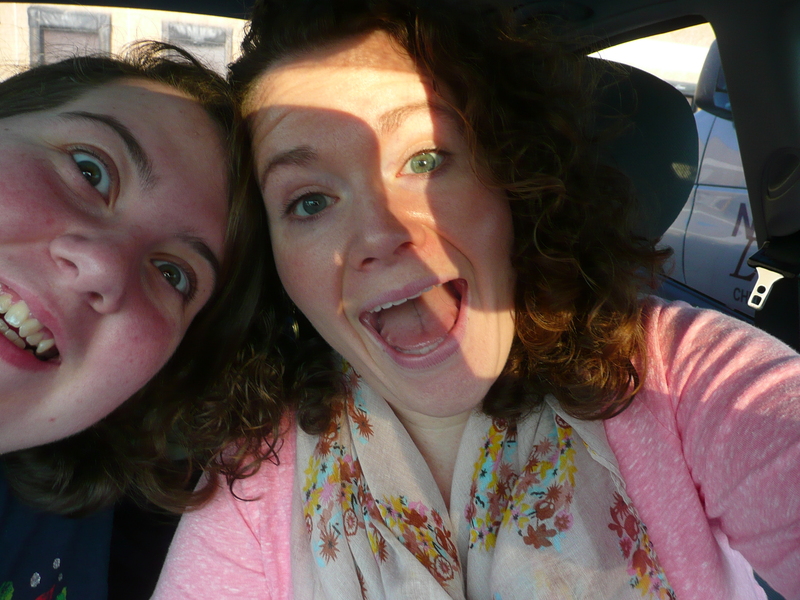 It was even better when I got to tell Alli where we were going – she was just as excited as I was. We got to the processing center that morning to find so many people already there. The atmosphere was so joyous and welcoming. We went through a short training and then were taken to our line. There were 16 lines in the warehouse. As we were some of the first volunteers that morning, they were not all full yet. 8 people work on each line and Alli and I started out with the very important jobs of taping boxes, sorting them by age and gender, and packing them into bigger boxes. Alli became an expert at packing at least 15 shoe boxes into each carton. We were on the girl side of the line and found out that, indeed, the middle girl age is the one a lot of people choose to pack boxes for. In our time there we packed at least 20 cartons with girl boxes; with at least 10 of them being for girls ages 5-8. I’ve already begun thinking of ways to get more boy boxes and older girl boxes done for next year. At one point we were reminded that we would be the last people to touch the boxes before they went into the hands of the children who would receive them. We prayed over them and I could not think of a better way to spend that day. We also chatted with other volunteers and found out there were people from at least 6 or 7 different states at the center that day. Towards the end of our shift we got to change up jobs and inspected the boxes. It was fun just to see what ideas other people had for packing their boxes. From baby dolls and soccer balls (with pumps), to an actual pair of shoes and a photo Christmas card. Before we left, we stopped in the prayer room. 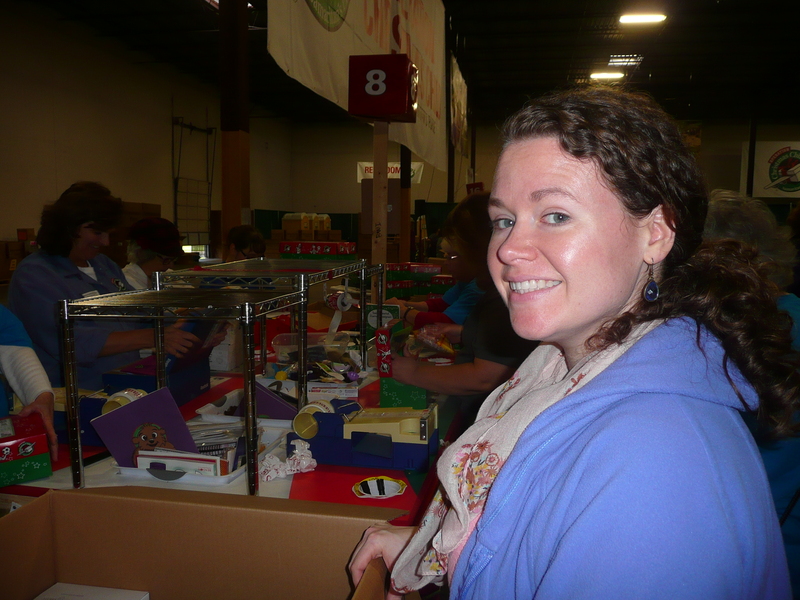 Alli and I prayed for the other volunteers and for the children who would receive the boxes and I was overcome with the enormity of not what just we were doing, but what God was doing through all of the people there. 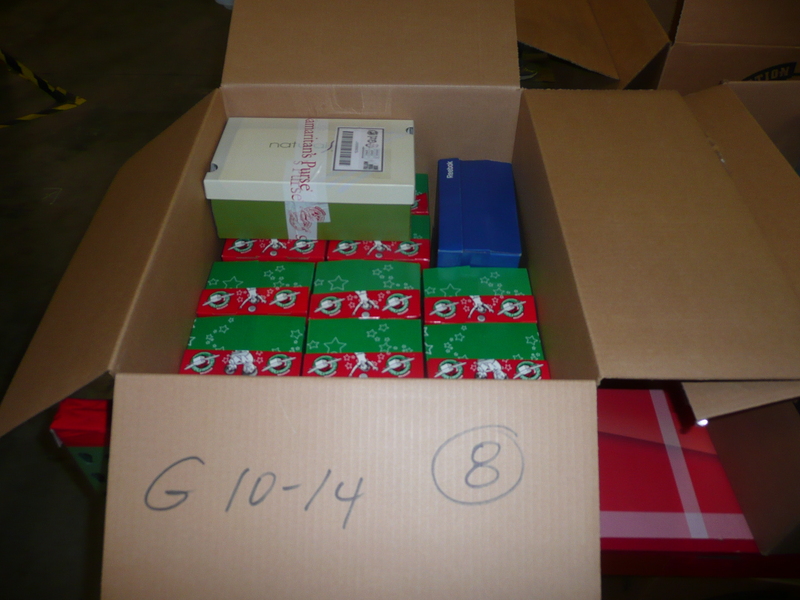 Through those who took the time to pack a shoebox. Those who collected them at churches around the country. Those who drove them to processing centers around the country. Those who volunteered at the processing centers. Those who would distribute them to children around the world. All of those people. Working together to show children (and their families) the love of Christ through a simple Christmas gift. After all of this, I cannot deny that I have pondered becoming a year-round volunteer with Operation Christmas Child. I’m waiting just a little bit to see what the not-too-distant future might hold (more on that later). I cannot get out of my head the idea of actually getting to hand out these shoeboxes, though. To be that connection between a child and the love of Christ. I cannot think of anything more amazing or worthwhile. In this season that gets so busy with trying to get Christmas “done right” have you taken the time to remember the reason for the season? I know I got more caught up in it than I wanted to. In the end, though, we need to remember it’s all about a baby in a manger. The Son of God come to save us all. Born to die, so we don’t have to. I hope amongst the trees, wrappings, presents, cookies, parties and whatnot, you’ve have time to think about that. The love of God, in giving His Son, the first and greatest Christmas gift of all. Every now and again things are in need of a reboot. Whether it’s to take a rest, refresh, or just start over. I’ve been feeling like that too, lately. Worn out and just plain blah. Out of sorts and wondering where this path God’s leading me down is headed. Wondering if there’s a turn coming up ahead and what that might involve. But, most honestly, really wanting to be “on fire” for Him again. In the past weeks I have felt like there was something more I should be doing, but really had no idea what it could be. As I pondered, prayed, and talked about this with friends nothing really came…at first. I have been coordinating Operation Christmas Child at my church for 3 years now. (If you do not know what OCC is, please take some time to check out their website – they are nothing short of amazing.) It is something I find great joy in; knowing that not only will kids around the world be given a shoebox full of gifts, but will also be told of the greatest gift ever given to mankind; Jesus Christ, the Son of God, and the sacrifice He made for us to be able to have a relationship with God. I cannot help but get excited when I talk about it, even when I think about it. I organized a packing party at church this year and we had a great turnout! We had at least 20 people come and we filled 54 boxes! It was such a great night of fellowship and fun. I was overwhelmed with what people were willing to give; especially when it came to paying for the shipping of all of the boxes. During that night and later I was talking with some friends about organizing a group trip next year to go to the processing center in Maryland and volunteer. This really got me excited; excited in a way I have not been in a long time. The more I thought about it, the more I felt a nudging to go…and not to wait a year to go, but to go now. So, tomorrow, after church, I’m taking a young friend of mine and we are driving to Maryland! I’ve booked a hotel for the night and our volunteer shift is from 9-1 on Monday. I cannot help but smile when I tell people this. Who am I kidding? I cannot help but smile as I’m typing this! I get to serve “the least of these” and I don’t think there’s anywhere else I’d rather be come Monday morning. I don’t know what this means for the future, or where it will lead me, but, right now, I’m not worried about that at all. I’m already planning ideas for next year’s packing party, devising ways to collect various supplies, thinking of how we could plan a church-wide trip to volunteer. This feels so right and I’m excited (yes, I’m going to say it again), so EXCITED, to see where this leads! This is the reboot I needed. Coming at just the right time (Thank You, Father, for showing me, again, how perfect Your timing is). Please pray that I continue to seek out His will and follow His path in this delight-filled endeavor. That I may be as excited to share the Gospel with my neighbors as I am to share it with children around the world. As this time of year tends to be hectic, I pray you will take time to reboot. Take time to ask our Father just what it is you should be doing in this festive season. Most importantly, once He’s told you, do it. I have no doubt that it will bring Him glory, and you great joy. I hope you all have enjoyed a wonder-filled Christmas season! For me, it was the first time I was not traveling at Christmastime since I as living at home with my folks some 13 years ago. I had spent most of my vacation time with family earlier in the year and I was a little relieved that I wouldn’t have to fight the holiday traffic & craziness at the airports. I love my family, don’t get me wrong (you hear that, Ma – I love you! ), but have also been blessed immensely with friends here who might as well be family too. Christmas Eve at work included a surprise visit from Santa (who was supposed to visit the local hospital but there were no kids there; a Christmas blessing, indeed), lunch with friends, and me playing various Christmas CDs on my computer (including the soundtrack to The Muppets’ Christmas Carol). After work I got home in time to pack my overnight bag, gather some goodies for the evening, make a couple last minute gifts (more info on those Friday), throw everything in the car, and head to church for music practice before the service started. After service my friends, Michael & Robin, hosted an open house. This time was full of friends, food, & fun. I spent the night there so I could celebrate Christmas morning with them and their family. It was a nice, quiet, and relaxing day that ended with some more friends coming over to have a lovely Christmas dinner of Chinese take-out. It was a wonderful couple of days; I was able to talk with my family & even video chat with some. There was much to enjoy, but I feel as if I’ve left something out. Let’s rewind (you do know what that means, right?) a bit; back to church on Christmas Eve. This was also very special to me – being able to be a part of our Christmas Eve service. Always traveling, I had never been able to attend. Words cannot adequately express what it is like to be in a darkened chapel with 60-75 people all holding candles, singing, “Silent night, holy night, all is calm, all is bright.” It is beautiful, awesome, and powerful; realizing some 2,000 years ago the Son of God, the One who was with God in the beginning, the One who is God, humbled Himself & put aside His glory, to be born, of a virgin, as a human. He was born, as all babies are, completely vulnerable and dependent upon His earthly parents. The Lord of all creation came to us, a mere baby, because He loved us so and wanted to make things right between us and our Father again, once for all. He did not stay a baby, of course not. All babies grow up into children, and those children into men and women. This baby, this Jesus, grew into a man; a man who worked many miracles, taught many truths, and saved many lives. In fact, He’s still doing that today. This humble babe, born in a manger, grew to a man, knowing one day He would die for many; for as many as would believe in Him and call upon His name. He lived a sinless life, and when the time came, He gave up that life; no one took it from Him; He gave it up freely as a perfect sacrifice, the only sacrifice that could ever reconcile the sinful heart of man with the God who created him. Of course, we know, it doesn’t stop there. Jesus’ death was followed by His resurrection, proof that He has overcome death and the grave. And that, my friends, is what gives us hope. If He is indeed our Lord & Savior, we have the greatest hope; that we will, one day, be reunited with Him. And that, truly, is the best Christmas Gift. I pray your Christmas was not only merry and bright, but also that you had time to reflect on what it really means and the great Gift we were all given, those many years ago, as a star shone brightly over a baby asleep on the hay.